Stalactites is an iconic Greek restaurant in Melbourne city centre that is always busy with lots of customers and is now the first Greek restaurant in Australia to gain Coeliac Australia accreditation. 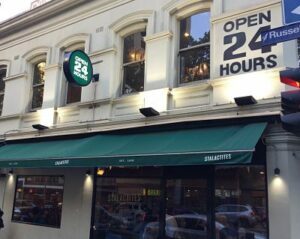 They are open 24 hours a day, so it is fantastic for those late night munchies! Located at the Chinatown end of the city on the corner of Lonsdale Street and Russell Street, Stalactites is in a great location for many of the theatres, such as The Comedy Theatre and Her Majesty’s Theatre. The owners also run Hella Good, which is a souvlaki takeaway shop which also has Coeliac Australia accreditation. 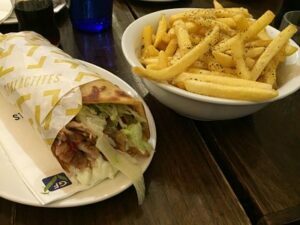 Both the restaurant and takeaway store are great places for gluten free Greek food in Melbourne. The vibe at Stalactites is casual and busy, with the kitchen on display and a lot of staff moving around the many tables. There are, of course, stalactites on the roof! The menu is comprehensive, with many gluten free options available, including in the children’s section. A popular option is the souvlaki ($17) which is made gluten free with a GF pita, which is $2.50 extra. My gluten free souvlaki came with a Coeliac Australia accredited logo on the serviette, which meant I was comfortable that I had the gluten free meal. The pita is soft and holds together really well – I wouldn’t have known it was gluten free! All the souvlakis come with lettuce, tomato, onion and homemade tzatziki. I chose the marinated chicken and it was absolutely delicious. You can add up to three other toppings, such as cheese, or chips inside the souvlaki. The chips are gluten free, as well as some salads and dips. For a larger dinner, there are choices such as main giros ($32) or meats from the grill (e.g. steak, lamb) which start at $38. If you still have room for dessert, the gluten free option is Creme Caramel. 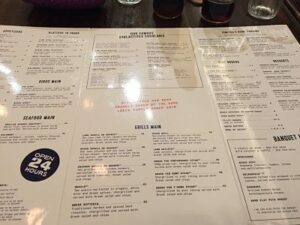 The takeaway menu is nearly as comprehensive as the sit down menu – check for the current menus on their website. 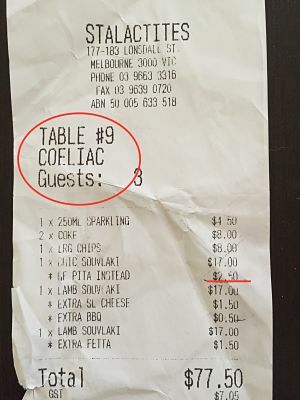 I was pleased to see that COELIAC was written in large letters on the receipt to alert staff to the need for gluten free. Delivery is available to surrounding areas on Uber Eats, Deliveroo and Menulog. For dining in, you can only book for groups of over six, eight or ten depending on the time of day (see booking policy on the website), so you need to be prepared to queue for a table. I have got in early for dinner easily, but once it hit 6.30pm, the queue was out the door. It is so great to have another gluten free option in the city and I would recommend Stalactites for gluten free Greek food in Melbourne. 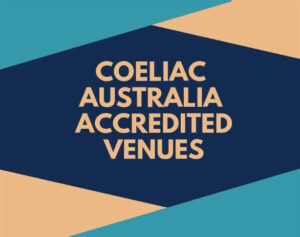 Stalactites is also included in the Coeliac Australia accredited listings.